We believe that the success of our business hinges on your satisfaction. This is why we use the highest quality window products and provide you with excellent installation service. 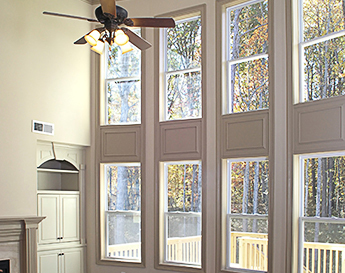 Ace Door & Window has specialized in window installation and window replacement in Jacksonville for many years. Our experience, partnered with our commitment to our customers, allows us to state that we are your "#1 Source of Doors, Windows & Installations!" Call us today at (904) 438-3981 for free estimate on whole house window replacement. Along with the stock of replacement windows we offer in Jacksonville, we also can provide your home with a specialty window solution. From unique shape and size, to different style and grille options, you can customize your window installation experience. By working with one of the Ace Door & Window professionals, we can design a unique, specialty window for your home in Jacksonville. Whether you are seeking a specific specialty window design in Jacksonville for your new home still in the construction phase, or want to replace an old window in your preexisting home with a custom window, we can provide you with services that surpass your expectations. Ace Door & Window is a window replacement contractor serving Jacksonville, Atlantic Beach, Neptune Beach, Jacksonville Beach, Ponte Vedra Beach, Arlington and Southside Jacksonville, Florida. Call (904) 438-3981 today to discuss a window installation for your Jacksonville area home!